Sublime beaches, glorious waterfalls, and lush jungle scenery are just a few of Bali’s natural gems – and a large part of why visitors flock to the Island of the Gods every year. Thanks to growing demand from visitors, Bali’s tourism sector has advanced to become Indonesia’s most opulent destination. In fact, this tropical, sun-soaked bolthole is well-known for its array of high-end offerings, making many tourists wonder, how to travel in Bali on a budget. However, that doesn’t mean you need to be a big budget traveler to enjoy the best of what the island has to offer. In fact, some of the island’s quirky, hidden destinations can offer an equally luxurious experience for those traveling on more of a limited budget. There are plenty of cheap things to do on the island – and some of the finest natural attractions are totally free. As a general rule, the further north you travel on the island, the less expensive things are. There are plenty of budget deals to be discovered in resort towns like Kuta and Legian, but you’ll find it a little more challenging to barter the best deals in the more touristy parts of the island. Thanks to its dramatic setting in one of Ubud’s craggy, heavily wooded ravines, Bridges is a restaurant that certainly packs a powerful punch of visual wow factor. The cuisine here is traditional French fare with a distinctive Asian twist, plus the restaurant is home to Bali’s only wine bar for guests who fancy themselves as connoisseurs. Spread over seven storeys, guests have plenty of choice when it comes to settings within the restaurant, from the pretty bistro terrace to the chic cocktail lounge. Thanks to the splendid surroundings, guests at Bridges could easily be forgiven for expecting to pay a lot more for their memorable Bridges experience. In the West, it often seems to be the case that many of the health-focused, organic eateries serving up platefuls of superfoods come at a premium when it comes to price. However, that’s not the case in Bali. In fact, if you’re on the lookout for a stylish spot for a healthy, wholesome lunch whilst exploring the delights of Ubud, head to Alchemy. This health food joint serves an array of tasty dishes, and you can fill your salad plate with a generous helping of usually expensive superfoods for the equivalent of about US$3.80. There’s also a selection of smoothies and healthy – yet delicious – desserts for diners to fill up on, too. Bali is home to an array of natural treasures, the splendor of which you will not see anywhere else in the world. In fact, Bali’s natural gems represent some of the island’s richest treasures – but you can see many of them for free. One way to enjoy the best of the island’s opulent attractions when you’re traveling on a budget is to seek out one of its many hidden beaches. Bias Tugel, also known to locals as Pantai Kecil (‘Little Beach’) is a true hidden gem. It is certainly one the top places for those interested in how to travel in Bali on a budget. Nestled on the coast at Padang Bai, visitors are required to trek for 500m across a rocky path to reach their destination – but their efforts are rewarded with a charming stretch of sandy shoreline that’s nowhere near as busy as some of the more popular beaches in Bali. Thanks to the serene waters, Bias Tugel is perfect for those who want to take part in active pursuits like swimming and snorkeling. Likewise, the gleaming golden sands and luminous blue rock lagoon offer a picturesque opportunity for Instagrammers. There’s a sprinkling of huts and stalls selling drinks and snacks to graze on as you take in the glorious scenery, too. All in all, this sparkly stretch of coastline is the ideal spot for those who want to soak up the finest of Bali’s natural treasures – for free! How to get there: A few hundred meters south of the entrance port to Padang Bai, keep your eyes peeled for a handwritten sign directing you to ‘White Sand Beach’. Park up here and begin your trek up the rocky path towards Bias Tugel Beach. If you want a break from beach-hopping, another crowning jewel in the plethora of Bali’s spectacular natural attractions are its waterfalls. Of course, Bali’s splendid cascades are free to visit, too, so you can soak up yet more of the island’s natural luxury without having to spend a penny. Situated approximately 80km from Denpasar, Aling-Aling Waterfall is one of our favorites. This mighty torrent of water enjoys a position far-flung from Bali’s well-trodden tourist track, so visitors can enjoy a unique experience. The impressive cascade features a drop of 35m, although the stream of water splits at the top, so each one cascades down the jagged rock at a different speed. The walk down to the falls is fairly long and steep – but you’ll be rewarded with some magnificent photo opportunities once you reach the bottom. Thanks to Aling-Aling’s secluded location, you can also be confident that your Bali photo album will have something a bit different from anyone else’s. Also important to bear in mind that this isn’t simply a cheap thing to do – it’s free. Daring visitors can even slide down the powerful cascade and into the pool at the bottom. How to get there: Travel from the city of Singaraja towards the village of Sambangan, where you will see road signs directing you towards the waterfall. Bali’s spa and wellness sector is one of the finest in Southeast Asia, so it figures that one of the most luxurious things to do whilst exploring the island is to indulge in a session of preening and pampering. The island is home to an array of high-end spas – but there’s also a plethora of excellent options where those traveling on a budget can still enjoy their very own pampering experience. 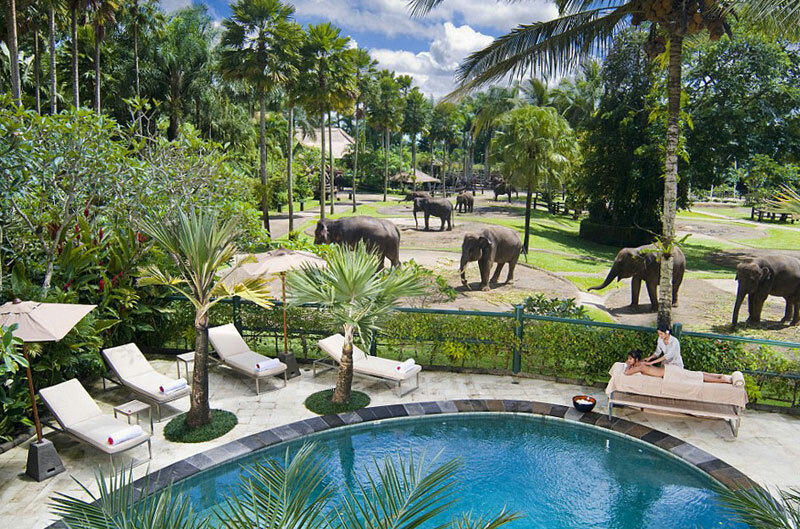 The Elephant Safari Park & Lodge has to be home to one of Bali’s most unique spa centers. Situated in the lush green landscape of Ubud, this establishment is worth a visit for one unique reason – it’s home to its very own herd of Asian elephants. The spa treatment rooms are set within acres of stunning botanical gardens and tropical forest, and you can even gaze out and glimpse one of the elephants meandering past as you enjoy your massage. Thanks to the fantastic and most unusual setting, you’d be forgiven for thinking that treatments at the Elephant Safari Park & Lodge all come at a hefty price. In fact, there’s a range of indulgent options that are available at extremely well-priced rates. For example, the 90-minute hot stone therapy is just US$40, as is the spa’s signature massage treatment. Throw in the wow-factor of the safari setting, and you can be confident you’re onto a winner. To learn more about other unique SPA spots in Bali, check out our article on the 10 amazing Bali spas you never knew existed. There are plenty of lavish, fine-dining experiences to be had in Bali – but you don’t have to pay the earth for a luxurious culinary experience, as Masaman demonstrates. This stylish restaurant is situated within a converted warehouse, a setting that is somewhat outside the realms of the tropical allure you may expect from Bali. Sleek and stylish, this establishment is infused with a mix of 1920s Shanghai and a British colonial feel – so you can look forward to a unique dining experience. Will Meyrick, the chef responsible for Masaman’s menu, has taken inspiration from traditional Asian street food – but all the dishes here come with an irresistible, high-end flourish. Mains in the restaurant on the first floor start from an extremely affordable IDR100,000 – which equates to approximately US$7.50. For a truly luxurious splurge, Masaman also offers a sublime tasting menu, but even dishes from this selection don’t cost the earth. In fact, the most expensive dish – slow-braized short rib beef salad with green shallot Asian celery coriander & Sichuan chili dressing – is IDR110,000 – about US$8. What could be more luxurious than indulging on an array of sweet and savory delicacies at afternoon tea? Costing just $15 per person, we couldn’t omit afternoon tea at The Orchid Tea Lounge from our selection of opulent experiences for those traveling Bali on a budget. Set within a striking modern glasshouse bathed in natural light, a regal array of orchids form some of the lounge’s main attractions. The vivid rainbow of petals that cascade throughout the room imbues this tea establishment with nothing short of real wow factor – and the blooms offer up a plethora of unique photo opportunities, too. In addition to the exquisite setting, there’s a fine selection of gourmet treats for guests to experience, too. The collection of teas includes green black, flavored, herbal and oolong infusions, so guests can really take their pick depending on what tickles their fancy. There’s also an array of specialty coffees, ice teas and local infusions – including rosella, lychee, and lemon ginger. Fruit tartlets, sandwiches, and classic Balinese desserts offer a sumptuous cherry on the cake. Afternoon tea at The Orchid Tea Lounge is served daily from 2 pm until 5 pm. If you’re concerned about being priced out of some of Bali’s more glamorous beach clubs, than don’t panic – there’s still plenty of elegant oceanside establishments where sunset cocktails won’t break the bank. One such venue is The Boardwalk Restaurant on Kuta Beach, which encompasses The Boardwalk Beach Club. Situated right on Kuta Beach, this stylish, laid-back establishment enjoys spectacular views of the ocean, making it a top spot for sunset seekers. The deck boasts an array of plush sofas and chairs for lounging, and guests can dine on an extensive selection of beverages whilst grazing on tapas-style dishes. Cocktails start at a very reasonable US$5, so Boardwalk Beach Club is ideal for those who don’t want to spend a fortune on each drink. The sophisticated Mediterranean-inspired vibe makes this beach club an establishment you’ll want to return to. The Island of the Gods is home to more than its fair share of upscale yoga and wellness retreats – but what about classes for those who haven’t got the budget to experience high-end yogic bliss? When it comes to yoga, Bali has something for everyone. Thanks to its secluded position on the laid-back island of Nusa Penida, just a short boat ride from Bali’s Sanur, Serenity Yoga offers guests something a little bit different, too. Practitioners of all levels are catered for, from absolute beginners to experienced yogis. There’s a range of yoga styles practiced at Serenity, too, including vinyasa, hatha and even stand-up paddleboard yoga – the latest craze to take Bali’s studios by storm. With its gorgeous beachside setting and attractive open-air sala, you might think that a few classes or a retreat at Serenity will take a heavy toll on your bank balance – but that’s not so. For those keen to economise, pay as you go drop-in classes cost IDR110,000 – just US$8 each. If, on the other hand, you’re keen to re-create the retreat experience without actually investing in a fully-immersive experience, a five-class pass costs IDR500,000 ($US37). We felt that our list of cheap places to go in Bali wouldn’t be complete without at least one more chilled-out beachside bar where guests can soak up the magnificent sunset views – without it costing the earth. Thanks to the proximity of the surf, sundown vistas from The Sand are every bit as wonderful as they are from any of the island’s most upscale establishments. Reclining in a beach beanbag won’t cost too much, as main meals start at the bargain price of just $US5. After sunset, the adorable chains of lanterns overhead flicker to life, giving this beach bar a truly magical air. 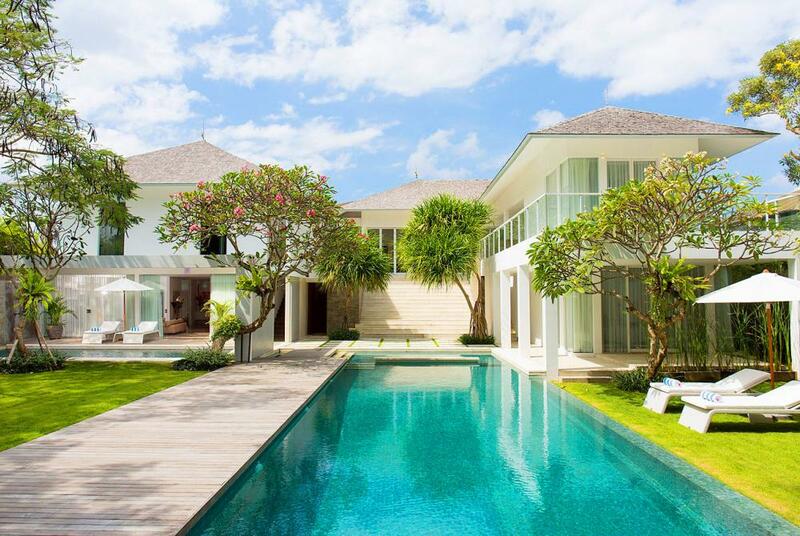 One more matter that acts as a sort of a cornerstone is the accommodation – is that possible to find a luxurious, yet affordable place to stay in Bali? 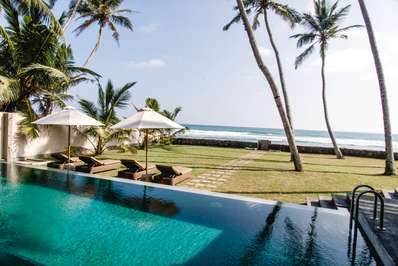 Our answer is yes – check this selection of Bali private villas that are spacious and equipped with private pools on the one hand, and are suitable for tourists traveling on a budget on the other.